Huge Savings Item! Save 18% on the Franmara 7308-C Plastic Stem Grip Dishwasher Caddy For Wine Glasses by StemGrip at Verve Wine Bar. MPN: 7308-C. Hurry! Limited time offer. Offer valid only while supplies last. This gorgeous White and Blue Plastic Stem Grip Dishwasher Caddy for Wine Glasses has the finest details and highest quality you will find anywhere! This gorgeous White and Blue Plastic Stem Grip Dishwasher Caddy for Wine Glasses has the finest details and highest quality you will find anywhere! White and Blue Plastic Stem Grip Dishwasher Caddy for Wine Glasses is truly remarkable. 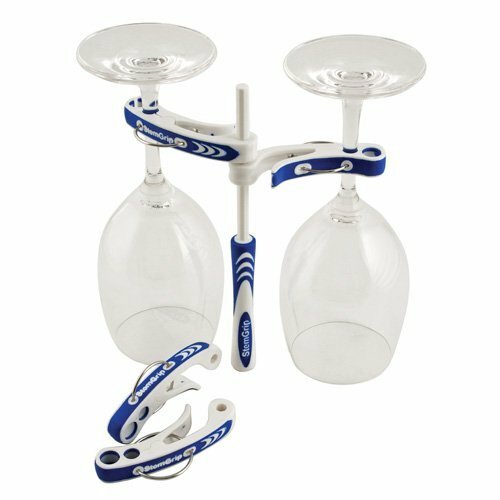 White and Blue Plastic Stem Grip Dishwasher Caddy for Wine Glasses Details: Condition: Brand New Item SKU: SS-FWA-7308-C Dimensions: H: 3.75 () More Information: - Stem Grip Safely wash stemware in the dishwasher with Stem Grip. - A set consists of one octagonal sided post that fits onto a tine in the lower rack. - Each set can hold four Piece Sets of stemware. - By turning each glass upside down and placing a clip on each one, Position the glasses around the post then slide the octagonal side of the clip over the central post. - Stemware will stay secure during washing. If you have any questions about this product by StemGrip, contact us by completing and submitting the form below. If you are looking for a specif part number, please include it with your message.